Hard drives have been a big bottleneck in computers since the inception of computing. While platter drives offer a lot of storage for an affordable price, they have always been handicapped by relatively slow speeds, unless you bought one of the high-priced 10k RPM drives or put them in a RAID 0 configuration. When the first consumer solid-state drives (SSD) came out, they offered impressive speeds in small sizes but at a high price. Luckily things have changed and today the prices of SSDs have dropped dramatically with affordable models running $100 for 240GB of 500MB/s storage. You pop two of those in a RAID 0 configuration into a machine and you are close to saturating the SATA bandwidth of modern machines. This however means you will probably never get the full speed out of an SSD, especially when you put them in RAID. In other words, we need to get away from the SATA standard. Thankfully, there are several new technologies that aim to get away from the SATA bottleneck. While SATA Express, which utilizes two SATA ports together, hasn’t really taken off, the M.2-based SSD offers us speed freaks hope. This technology uses the PCIe lanes, something GPU’s have been doing for a while. This means that blistering speeds of 500 MB/s in a small form factor now is a reality. Kingston has really pushed the envelope with the 480GB HyperX Predator M.2 PCIe SSD that we are reviewing today; promising 1400MB/s read and 1000MB/s write speeds. Don’t fear the Predator. Well, unless you don’t have one that is. 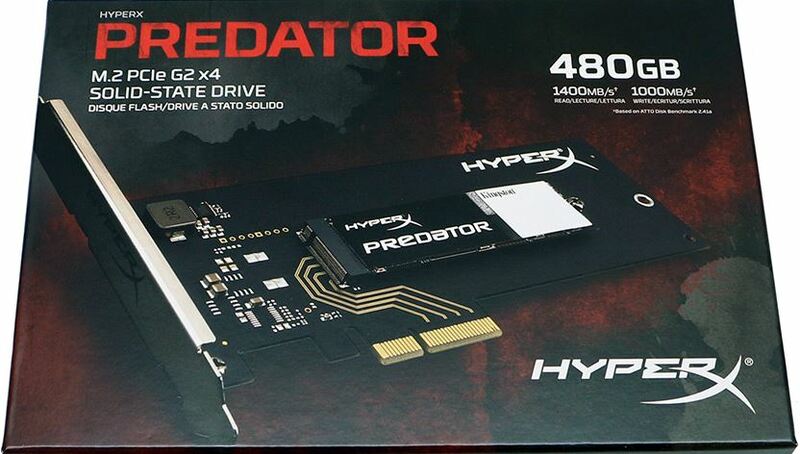 The 480GB HyperX Predator M.2 PCIe SSD is a 480GB Predator M.2. form factor SSD mounted on a PCIe x4 adapter, rated to run at 1,400MB/s read and 1,000MB/s write. If you think about it, that knocks the old method of displaying drive speeds right off the drive speed scale. Kingston can boast a 1.4GB/s read and 1GB/s write Predator drive. If you know Kingston like we know Kingston, every iota of advertised speed is on that little drive, and we would venture to say that every speck of speed is there and in some cases more. Slated to originally be released in February, the heavily anticipated drive was delayed a couple of weeks so that Kingston could perfect the firmware on this new, high-end PCIe SSD aptly named the Predator. Kingston took the extra time to perfect the firmware because this is their current flagship SSD in the HyperX lineup. Not only is this Kingston’s flagship SSD, it’s their first M.2. PCIe solid state drive. Featuring a PCIe Gen 2.0 x4 interface to deliver scorching speed, the 480GB HyperX Predator M.2 PCIe SSD sets a new standard in SSD speed and availability. 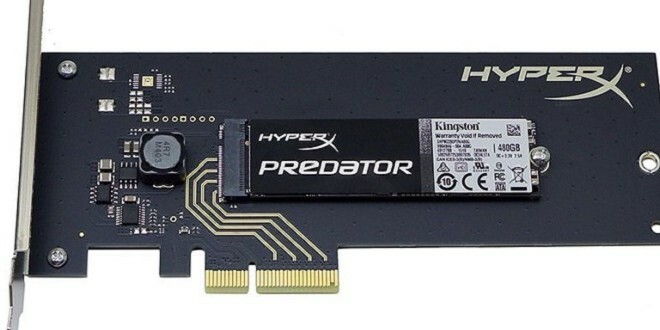 We hate to even say this, but if this is their first effort, we wait with bated breath for the next evolution of Kingston’s HyperX Predator SSD line. Like the box says, the Predator is capable of 1,400MB/s read speeds; the equivalent of three SATA SSDs in Raid 0. And this is the first M.2. PCIe G2 x4 SSD that Kingston has offered. No worries, there is am M.2 model that is slightly less expensive and the boot ROM is on the M.2 portion of the 480GB HyperX Predator M.2 PCIe SSD. As pictured in the table above, Kingston offers four Predator drives, with a fifth 980GB model due out in the 3rd quarter of 2015. The 240GB model is a little more affordable and offers the same read speed, but takes a write speed hit and loses 400MB/s compared to the 480GB models. The differences in speed are due to the amount of NAND flash on the given drives and how it connects to the Marvel 88SS9293 controller. Given the $11 minuscule price difference, we say go ahead and get the PCIe model. Eleven bucks isn’t going to kill anyone, and even if you use the drive in it’s M.2. form factor, the PCIe x4 M.2 adapter card is worth having. IOPS are a bit confusing for some people, but it’s just means input/output operations per second and you can expect 130,000 read IOPS and 118,000 write IOPS from the 480GB HyperX Predator M.2 PCIe SSD. Should I put the 480GB HyperX Predator M.2 SSD (just the M.2 portion) into my portable computing device? Well, if your portable device supports the M.2 form factor and AHCI, you certainly can, but you should know about the voltage requirements as they are steep for an M.2 SSD. This M.2 SSD requires 1.38W Idle / 1.4W Avg / 1.99W (MAX) read / 8.25W (MAX) write. At 8.25 watts max write, the 480GB HyperX Predator M.2 SSD is better suited to desktops. However, if you are a portable user that stays connected to the power outlet or doesn’t mind a shortened battery life, you can use it in your portable computer. We covered a lot of this information, but as you can see the warranty is three years with one million hours MTBF (Mean Tine Before Failures). A little spit ball math here: 1,000,000 / 24 (hours in a day) = 41,666.66 days before failure. So 41,666.66 / 365 (days in a year) = 114.155 years MTBF. We aren’t sure about that life span, but check back with us in about 114 years and we’ll let you know. Included in the package is the 480GB HyperX Predator M.2 PCIe SSD, a half height bracket, a coupon for Acronis True Image HD software (Serial number erased for security purposes), a little manual and a HyperX case sticker. The Samsung XP941 is commercially available! You don’t know what you’re talking about. Moreover the Plextor M6E doesn’t quite give this a run for its money but in most practical situations you’re not going to see much difference. The Samsung XP941 is not the same speed drive and substantially slower ergo my statements hold true, The XP941 runs at max 1GB/s and 800MB/s a second read. As mentioned the Plextor M6E is also substantially slower and close to impossible to get. Intel now has a drive that smokes the Kingston drive but you better believe it will smoke Kingston’s price as well. The 480GB HyperX Predator M.2 PCIe SSD is a glimpse of the future of storage and you can hold it in your hand today.